If the childhood fantasy that animals can talk continues to inspire the moviemakers at Disney, then "The Country Bears" represents a very serious error in judgment. Most of us have delved into the possibilities of our wild neighbors having the intellect and characteristics of normal human beings, but seldom have we imagined them looking so ferocious or foreboding as they appear to be in this screen treatment. Based on the famous Country Bear Jamboree attraction at Walt Disney World, here is a movie all about concept and nothing about forethought; it walks and talks like an endearing fable, bankrupt of the realization that it can be creepy and unsettling on the eyes. The bears I speak of in this situation aren't cute little furballs with wet noses and big eyes; they're enormous and loud grizzlies (or brown bears, one of the two) who look like they're about to ingest any nearby civilian every time they smile or stare at someone. The scariest part: no one seems to acknowledge or even care that these creatures are living productive lives among the human race, walking and talking as if they've done this sort of thing right from the beginning. That kind of conflict was somewhat relevant with last week's theatrical release "Stuart Little 2," but at least that film knew its hero was not human and worked it into the story. In "The Country Bears," people don't gawk, show concern, or even feel threatened by the creatures. Their acceptance is so unconditional that it leaves us feeling unnerved and unconvinced, and the movie has close to no chance of survival as a result. When the picture opens, we're gazing at life-size moving scrapbooks of a fictionalized rock/country band dubbed the Country Bears, consisting of (you guessed it) four-legged grizzlies who can sing, beat drums, stage dive and work a large crowd with the utmost ease (how a bear can play the strings on a guitar with those enormous paws, I dunno). We are told that their popularity was unmatched by other bands of that era, until their abrupt split in 1991 for some undisclosed reasons. Later, close to ten years after that breakup, we're invited into a household in which a young grizzly named Beary is living as the adoptive son of a human family, although he doesn't know that yet despite the difference in his appearance. When his brother tells him of his true heritage, however, the furry teen packs up and leaves home, hoping to find himself at his lifelong dream location, the Country Bear Hall, where his favorite band played before they split so many years before. In present time, alas, the Hall is facing demolition by a mean-spirited bank manager named Reed Thimple (Christopher Walken), who provides the owners of the land just four short days to raise the $20,000 needed to cover the unpaid bills they owe. When Beary shows up in the midst of this turmoil, his immediate suggestion is to get the Country Bears back together for a benefit concert to raise the needed money. With this announcement, however, comes certain reservations: if there was a reason why the bears split up in the first place, how is it feasible that they could all put aside the past and reunite one more time? "The Country Bears" is mostly a road movie, in which Beary and the Hall's primary owner go out in search of the four members of the original band, who are spread out in different areas of the country and are living completely new lives. One is some kind of assistant to an up-and-coming pop star, one is renting from a local bar owner, played by Queen Latifah, and owes her money, one is a marriage counselor whose grief over his own lost love makes all his clients feel better about themselves, and the other is a wedding singer who, over the past few years, has created the illusion that he is a wealthy high-class business man (although he only rents a room above Elton John's house). There are reasons and conflicts at hand between the four that keep them all from making immediate commitment to this cause, but they're exploration is sidelined for a cliché in which the band members are able to quickly reunite under the influence of the simplistic, but wise, reasoning of a child's mind. On top of that, the movie has a weak subplot featuring two dimwitted cops who think Beary has been snatched away from his family, and a slew of unexpected (and sometimes unnecessary) cameos from famous singing stars like Bonnie Raitt and Willie Nelson. I realize that children's movies should be allowed to suspend much of this logic, but should they truly be allowed to test general intelligence? Who in the world is going to see this movie and not make clear separation of the bears and humans? Who is going to accept their peaceful coexistence without so much as a second look? 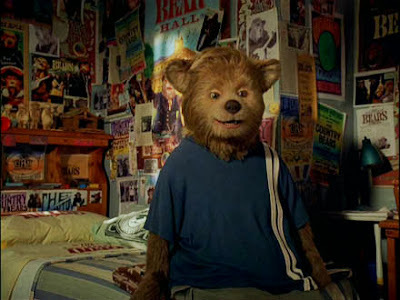 There is one character in the film (Beary's human brother) that has the right idea when the police are called over to the house to investigate the young animal's disappearance, and are provided with a portrait of the furry teen. "Gee, he looks... like a fourth grader," one of them announces. The kid throws his head back in frustration, stomps out of the room, and shouts back to his parents, "I'm going to my room and staying there until I'm 18." Good suggestion, kid; maybe we'll join you.